Klein Sun Gallery is pleased to be opening a solo exhibition of Beijing-based artist Geng Xue, who was recently shortlisted for the Young Artist of the Year recognition by China's most prestigious contemporary art prize, the 11th Award of Art China (AAC). 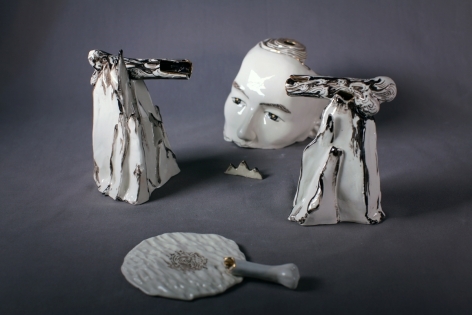 Mount Sumeru, the first major solo presentation of the artist’s porcelain and bronze works in the West, will be on view from May 4 through June 17, 2017. Featuring the series of sculptural works by Geng Xue, the exhibition references the sacred mountain Mount Sumeru, considered as the center of the physical and spiritual universe in Buddhist cosmology. 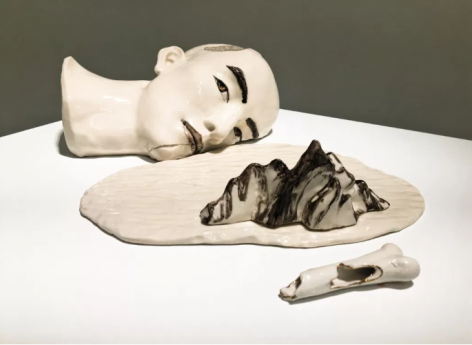 Inspired by Chinese folklore and philosophy, Geng Xue recontextualizes traditional porcelain, molding her sculptures as an array of truncated bodies blended into various ethereal landscapes. Rendering the works in diverse peculiar forms and scales, the artist then transforms the porcelain pieces into sound installations, where sound echoes and reverberates inside the structure, emitting a fluid resonance. Constructing a sense of the surreal and the uncanny, the exhibition endeavors to uncover the intricacies between perception and embodiment. 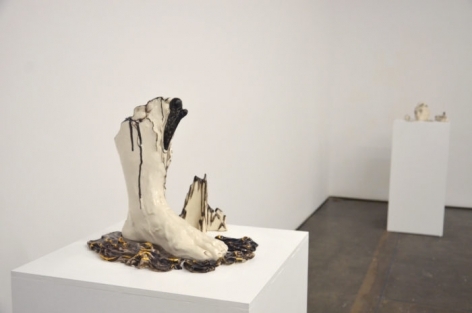 View Delusion 1 (2016) is a delicate work characterized by a male head surrounded by other sculptural elements such as miniature water ripples and mountains. Like many other of Geng Xue’s works in this exhibition, heads, feet, and hands, representations of the human body and perhaps symbolism of our consciousness, are often positioned in the middle. The body elements seemingly “dissolve” into the landscape, signifying the unity of the physical and the spiritual--the metaphysical contemplation often reflected in Geng Xue’s works. 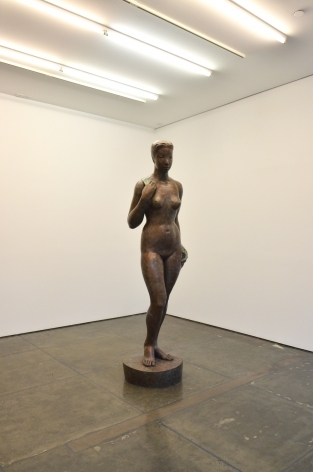 In her bronze work Big Woman Statue (2015), inspired by Michelangelo’s acclaimed David (1501–1504), Geng Xue constructs a standing woman holding a whip behind her, while her left hand holds another hand that does not seem to belong to anyone. It is as if someone was holding the woman from behind, yet the body is absent. The unidentified hand thus results in a void or unavailability, leaving room for imagination of whether or not there is another human figure. As one attempts to decipher this sculpture, the body created by the artist serves as the only tangible and available pathway. In the exhibition of Mount Sumeru, Geng Xue constructs a tale of human and otherworldliness. Recounting stories inspired by traditional Chinese methodologies, Geng Xue presents her delicate craft of whimsical ghost-like figurines and enigmatic landscapes, which are referenced in traditional chinese paintings, now rendered through a contemporary view. 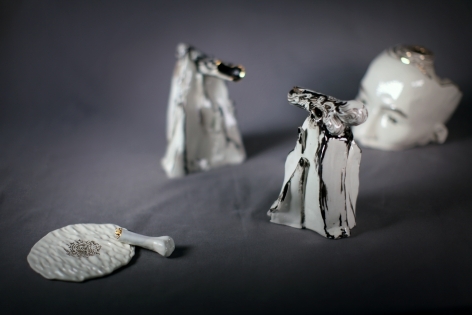 While merging narrative story with her exploration in porcelain as visual language, the artist activates our imagination that transcends different time and space, revealing her ontological thinking that the body is the primary site for knowing the world. Geng Xue was born in Jilin Province, China in 1983 and graduated with an MFA from the Central Academy of Fine Arts, Beijing, China, where she is currently teaching. 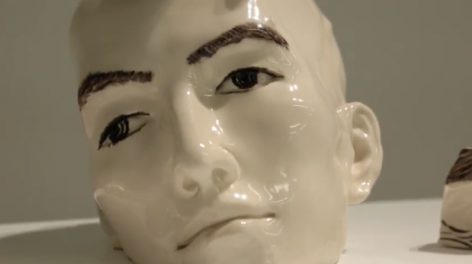 Her work has been exhibited around the world, including solo exhibitions Poetics of the Body–The Sculpture & Video Art of Geng Xue, Fengmian Art Space, Guangzhou, China (2016); Mr Sea, Art Museum of Nanjing University of Arts, China (2014), and The Other Side, National Museum of Wales, Cardiff, UK (2009). Her recent group exhibitions include, Amassing Force - 2017 Wang Shikuo Award: Today Art Museum Exhibition of Nominated Contemporary Artists, Today Art Museum, Beijing, China (2017); China, Art of Movement, Annecy International Animation Film Festival, Musée-Château d’Annecy, Annecy, France (2017); Holland Animation Film Festival, Utrecht, Netherlands (2017); Memory and Contemporaneity.China Art Today, Collateral Event of the 57th Venice Biennale, Giardini Arsenale, Italy (2017); Reciprocal Enlightenment, CAFA Art Museum, Beijing (2017); Fire Within: A New Generation of Chinese Women, Eli and Edythe Broad Art Museum, Michigan State University, East Lansing, MI (2016); Animaux Biennale, Museum of Contemporary Art Shanghai, China (2016); 4th Jakarta Contemporary Ceramics Biennale, National Gallery of Indonesia, Indonesia (2016); Tradition and Innovation: The Human Figure in Contemporary Chinese Art, Chazen Museum of Art, University of Wisconsin, Madison, WI (2015); China 8 - Contemporary Art from China on the Rhine and Ruhr, Germany (2015); Busan Biennale, South Korea (2014); Caissa Rising Arting, Today Art Museum, Beijing, China (2014), and The Start of a Long Journey, CAFA Art Museum, Beijing, China (2014). For press inquiries contact Nicole Aiello at the gallery or via email at nicole@kleinsungallery.com and for all other inquiries, please contact Phil Zheng Cai at the gallery or via email at phil@kleinsungallery.com. Sinovision interviews gallery associate Phil Cai about Geng Xue's solo exhibtion "Mount Sumeru". Writer Andrew Shiue reviews Geng Xue's solo exhibition "Mount Sumeru" as "a cross between surrealist art and Chinese painting." 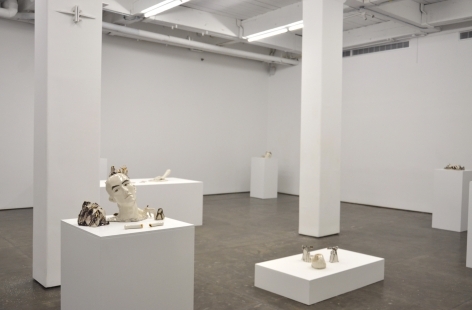 Art Radar reviews Geng Xue's solo exhibition at Klein Sun Gallery. 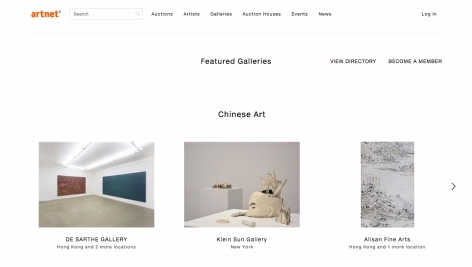 Artnet highlights Geng Xue's solo exhibition "Mount Sumeru" on their Featured Galleries page under 'Chinese Art'. Les Femmes Folles interviews Geng Xue about her solo exhibtion "Mount Sumeru" at Klein Sun Gallery. Art Fuse dissects Geng Xue's "Mount Sumeru" and her use of human body parts and sound installation to represent physical and spiritual elements. 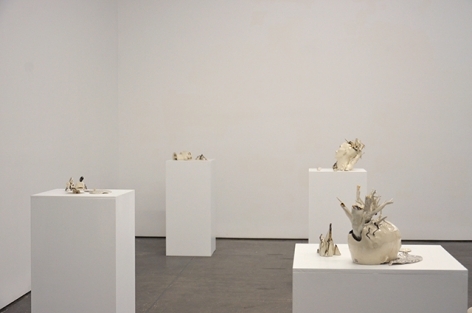 Blouin Artinfo features Geng Xue's solo exhibition "Mount Sumeru" at Klein Sun Gallery. artnet News includes Geng Xue's solo exhibition, "Mount Sumeru" in their go-to guide for Frieze Week. CAFA Art Info features Geng Xue's solo exhibition, "Mount Sumeru".